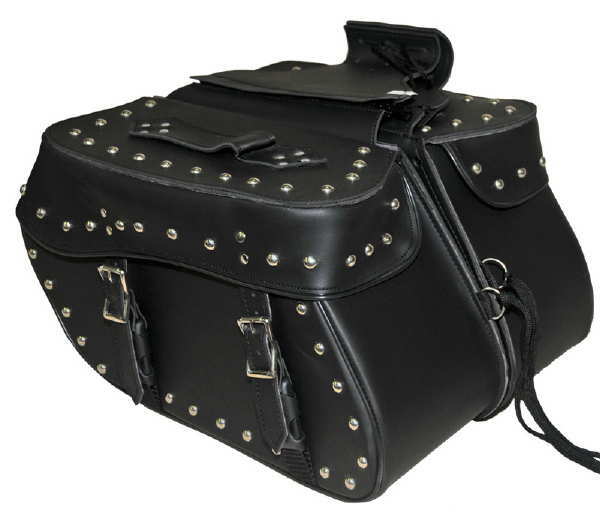 Featuring quick release zippered yokes, quick release buckles and convenient carry handles. Large capacity and popular slant shape. Double roller pin buckles with additional quick release buckles. Plastic reinforced for better shape retention with an internal snap flap for added security. Adjustable center yoke allows mounting over or under seat. Accented with 2 quick releas buckles. Chrome Studded Version is an option. Laces are included for secure mounting. Made with a Hi-Tech synthetic material that has the look and feel of real leather, without leather's high price. It is water repellent, won't dry out, fade, peel, crack or stain. The material wipes clean with a damp cloth and never needs creams or lotions. Measure side to side, from the back of the saddle, (riders position) to the arm of the directional signal, and compare the width measurements of the desired Willie & Max saddlebag. This measurement should be greater than the bag width. Measure from top to bottom. Use the bottom of the seat pad to the top of the exhaust pipe as a reference, and allow no less than 1" greater than the height of the desired bag for clearance. 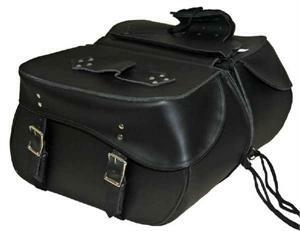 Saddlebag supports are strongly recommended, when available, for your make and model of motorcycle. 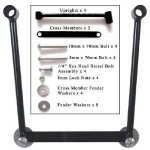 Value-Accessories has supports in stock for most bikes. Secure all 4 side tie down tabs with the supplied cable ties. Check saddlebags, fully loaded, to ensure that contact with the wheel or exhaust will NOT occur at any time. Note: For 2nd Day, Next Day Air or Priority Mail, there will be a surcharge for Dimensional Weight. Shipping charges at check out do not reflect dimensional weight surcharges. This item is in a large box and does not weigh that much in proportion to the size of the box.